my vraag exactly. . Wallpaper and background images in the The Heroes of Olympus club tagged: photo. THANK YOU!!!!!!!!!!!!!!!!!!!!!!!!!!!!!!!!!!!!!!!­!!! SOME ONE UNDERSTANDS!!!!!!!!!!!!!!!!!!!!!!!!!!!!!!!­!!!­!!!­!!!­!!!­!!!­!! Go to Random! There's a question that asks What Movie Frustrates You (not the exact words)? 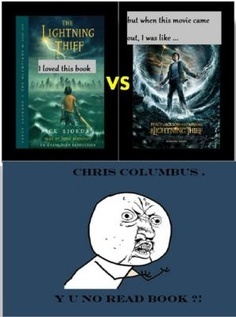 I kept on going on how CHRIS COLUMBUS didn't read the book!!! it happens a lot actually, but at least this one was reparable. Eragon, not so much. c'mon people, start up the virtual chant! Me: *starts a chant* READ THE BOOK, READ THE BOOK, READ THE BOOK. Get a bunch of fangirls. Create a fangirl army. Everyone: READ THE BOOK, READ THE BOOK. Producer: *casually sips a cup of coffee* Oh it's the fangirls again.